That's right, they all work just fine and are do-able! 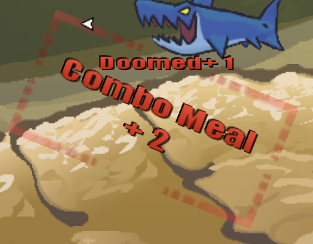 I also added some ">>><<<" to the combo text, they tick down as combo time nears it's end. When a combo's time would run out, it would flash up the total points earned, there is now an extra effect to help those stand out in the form of a frame. My main man tester Jay suggested having the achievements visible on the pause screen, which is an excellent idea. I have it functioning, and it only shows what you can get in the stage you are on. Simply move the mouse down and to the right or left to scroll them around to take a look. I most likely won't be posting anything until after new years, so everyone have a safe merry Christmas, and a happy holidays, and an excellent new years! Achievements:They fuction for the most part. There's still some that need tested, and a few that need fixed so they actually work. I did a lot of work on combo timing, to make some of these easier and let the player try to build up extra points if they like. Jetskis don't blow up as fast either. 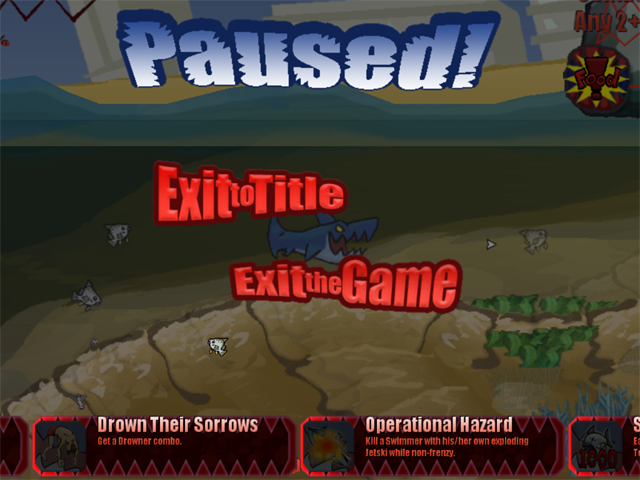 Drown Their Sorrows(3x drown combo) is being changed to just drowning one person, it's hard for me to even come close to drowning two let alone three! Push Me, Pull You's(snagged by 2 hooks) code just didn't work period, so I missed something. I had my doubts about Squid-Kebob(big squidy and little squidy hit with same spear), but I came within 2 pixels of pulling it off the other day. It's possible, you just need to find the right enemy placement and timing. This last Friday I toyed with the idea to upsize You Got The Shaft for 1024x768. I would make the tiles 48x48 instead of 16x16, so all my numbers would just need multiplied by 3. I also did a few Monsta animations at the new size. I wouldn't use near as many frames as the smaller ones due to memory. I'm also thinking of ditching the falling block thing and replacing it with combat related challenges. I dunno, what do you guys think of all this. I forgot to show off the barriers in that last video segment, durp! Next time I guess.